It's National French Fry Day and chef Laurant Tourondel is stopping by the TODAY Kitchen to share his do's and don'ts for achieving potato perfection. He's showing us his best tips and techniques for making restaurant quality fries at home — and sharing his own recipe! Master the art of making the perfect French fries in just 6 easy steps. A little extra effort pays off with amazingly crispy, golden and delicious results. A russet potato, like an Idaho or Burbank, works better due to the higher starch content compared to a waxier variety, like Yukon gold. It's best to use a peeler with a sharp point on the end to remove any eyes on the potatoes. Use a French mandolin, which is just less daunting and safer than a Japanese mandolin. But, if cutting by hand, depending on knife skills, I would recommend cutting them larger like steak fries. Cut off one edge of the potato before you start slicing your fries to make it more stable. Give your cut potatoes a good rinse and/or soak in cold water to remove any excess starch. It will help make your final product perfectly crispy. For a French fry that's soft on the inside and crunchy on the outside, you have to fry them twice. The first round in the fryer is done at a lower temperature of 260°F to 280°F. This will make sure the potato is cooked through, but not so much that it's falling apart. After par-cooking your potatoes need a chance to rest and cool down. But, don't wrap your cooling par-cooked potatoes in plastic wrap. The trapped moisture will make them soggy. Instead, leave them uncovered or lightly cover them with a clean kitchen towel and refrigerate. Allow potatoes to come down to room temperature before frying them. It make them crisper and helps keep the fry oil temperature more constant. The final fry on your fries will be done at a higher temperature of about 375°F. This will give them their rich golden color and perfect crispness. Drain fries on a wire rack set over a backing sheet, not on paper towels. 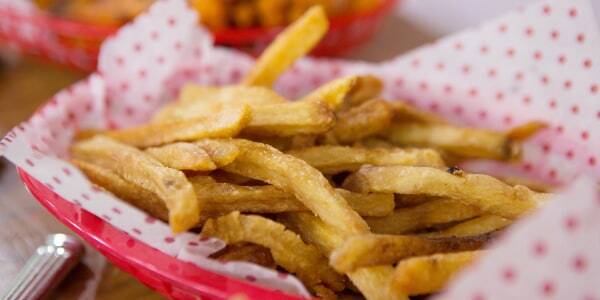 You need a little oil to stay on the surface of the fries so that the salt can stick better. Use a fine sea salt instead of course Kosher salt.